For other uses, see Devil (disambiguation). 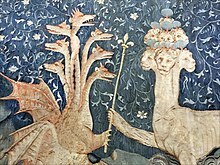 Satan (the dragon; on the left) gives to the beast of the sea (on the right) power represented by a sceptre in a detail of panel III.40 of the medieval French Apocalypse Tapestry, produced between 1377 and 1382. It is difficult to specify a particular definition of any complexity that will cover all of the traditions, beyond that it is a manifestation of evil. It is meaningful to consider the devil through the lens of each of the cultures and religions that have the devil as part of their mythos. The history of this concept intertwines with theology, mythology, psychiatry, art and literature, maintaining a validity, and developing independently within each of the traditions. It occurs historically in many contexts and cultures, and is given many different names — Satan, Lucifer, Beelzebub, Mephistopheles — and attributes: It is portrayed as blue, black, or red; It is portrayed as having horns on its head, and without horns, and so on. The idea of the devil has been taken seriously often, but not always, for example when devil figures are used in advertising and on candy wrappers. The Modern English word devil derives from the Middle English devel, from the Old English dēofol, that in turn represents an early Germanic borrowing of the Latin diabolus. This in turn was borrowed from the Greek: διάβολος diábolos, "slanderer", from διαβάλλειν diabállein, "to slander" from διά diá, "across, through" and βάλλειν bállein, "to hurl", probably akin to the Sanskrit gurate, "he lifts up". In his book The Devil: Perceptions of Evil from Antiquity to Primitive Christianity, Jeffrey Burton Russell discusses various meanings and difficulties that are encountered when using the term devil. He does not claim to define the word in a general sense, but he describes the limited use that he intends for the word in his book — limited in order to “minimize this difficulty” and “for the sake of clarity”. In this book Russell uses the word devil as "the personification of evil found in a variety of cultures", as opposed to the word Satan, which he reserves specifically for the figure in the Abrahamic religions. In the Introduction to his book Satan: A Biography, Henry Ansgar Kelly discusses various considerations and meanings that he has encountered in using terms such as devil and Satan, etc. While not offering a general definition, he describes that in his book "whenever diabolos is used as the proper name of Satan", he signals it by using "small caps". The Oxford English Dictionary has a variety of definitions for the meaning of "devil", supported by a range of citations: "Devil" may refer to Satan, the supreme spirit of evil, or one of Satan's emissaries or demons that populate Hell, or to one of the spirits that possess a demonic person; "devil" may refer to one of the "malignant deities" feared and worshiped by "heathen people", a demon, a malignant being of superhuman powers; figuratively “devil" may be applied to a wicked person, or playfully to a rogue or rascal, or in empathy often accompanied by the word “poor" to a person — "poor devil". The earliest Hindu texts do not offer further explanations for evil, regarding evil as something natural. However, later texts offer various explanations for evil. According to an explanation given by the Brahmins, both demons and gods spoke truth and untruth, but the demons relinquished the truth and the gods relinquished the untruth. But both spirits are regarded as different aspects of one supreme god. Even some fierce deities like Kali are not thought of as devils but just as darker aspects of God and may even manifest benevolence. Zoroastrianism probably introduced the first idea of the conceptual devil; a principle of evil independently existing apart from God. In Zoroastrianism, good and evil derive from two ultimately opposed forces. The force of good is called Ahura Mazda and the "destructive spirit" in Avestan-language called Angra Mainyu. The Middle Persian equivalent is Ahriman. They are in eternal struggle and neither is all-powerful, especially Angra Mainyu is limited to space and time: in the end of time, he will be finally defeated. While Ahura Mazda creates what is good, Angra Mainyu is responsible for every evil and suffering in the world, such as toads and scorpions. Among the Tengristic myths, Erlik refers to a devil-like figure as the ruler of Hell, who is also the first human. According to one narrative, Erlik and God swam together over the primordial waters. When God was about to create the Earth, he send Erlik to dive into the waters and collect some mud. Erlik hid some inside his mouth to later create his own world. But when God commanded the Earth to expand, Erlik got troubled by the mud in his mouth. God aided Erlik to spit it out. The mud carried by Erlik gave place to the unpleasant areas of the world. Because of his sin, he was assigned to evil. In another variant, the creator-god is identified with Ulgen. Again, Erlik appears to be the first human. He desired to create a human just as Ulgen did, thereupon Ulgen reacted by punishing Erlik, casting him into the Underworld where he becomes its ruler. According to Tengrism, there is no death by meaning that life comes to an end, it is merely a transition into the invisible world. As the ruler of Hell, Erlik enslaves the souls, who are damned to Hell. Further, he lurks on the souls of those humans living on Earth by causing death, disease and illnesses. At the time of birth, Erlik sends a Kormos to seize the soul of the newborn, following him for the rest of his life in an attempt to seize his soul by hampering, misguiding and injuring him. When Erlik succeeds in destroying a human's body, the Kormos sent by Erlik will try take him down into the Underworld. However a good soul will be brought to Paradise by a Yayutshi sent by Ulgen. Some shamans also made sacrifices to Erlik, for gaining a higher rank in the Underworld, if they should be damned to Hell. According to Yazidism there is no entity that represents evil in opposition to God; such dualism is rejected by Yazidis, and evil is regarded as nonexistent. Yazidis adhere to strict monism and are prohibited from uttering the word "devil" and from speaking of anything related to Hell. Yahweh, the god in pre-exilic Judaism, created both good and evil, as stated in Isaiah 45:7: "I form the light, and create darkness: I make peace, and create evil: I the Lord do all these things." The devil did not exist in early Jewish scriptures. However, the influence of Zoroastrianism during the Achaemenid Empire introduced evil as a separate principle into the Jewish belief system, which gradually externalized the opposition until the Hebrew term satan developed into a specific type of supernatural entity, changing the monistic view of Judaism into a dualistic one. Later, Rabbinic Judaism rejected[when?] the Enochian books (written during the Second Temple period under Persian influence), which depicted the devil as an independent force of evil besides God. After the apocalyptic period, references to Satan in the Tanakh are thought[by whom?] to be allegorical. In Christianity, evil is incarnate in the devil or Satan, a fallen angel who is the primary opponent of God. Christians considered the Roman and Greek deities devils. Christianity describes him as a fallen angel who terrorizes the world through evil, is the antithesis of truth, and shall be condemned, together with the fallen angels who follow him, to eternal fire at the Last Judgement. In mainstream Christianity the devil is usually also referred to as Satan. This is because Christian beliefs in Satan are inspired directly by the dominant view of Second Temple Judaism, as expressed/practiced by Jesus, and with some minor variations. Some modern Christians[who?] consider the devil to be an angel who, along with one-third of the angelic host (the demons) rebelled against God and has consequently been condemned to the Lake of Fire. He is described[attribution needed] as hating all humanity (or more accurately creation), opposing God, spreading lies and wreaking havoc on their souls. Horns of a goat and a ram, goat's fur and ears, nose and canines of a pig; a typical depiction of the devil in Christian art. The goat, ram and pig are consistently associated with the devil. Detail of a 16th century painting by Jacob de Backer in the National Museum in Warsaw. Satan is often identified[by whom?] as the serpent who convinced Eve to eat the forbidden fruit; thus, Satan has often been depicted as a serpent. Although this identification is not present in the Adam and Eve narrative, this interpretation goes back at least as far as the time of the writing of the Book of Revelation, which specifically identifies Satan as being the serpent (Rev. 20:2). In the Bible, the devil is identified with "the dragon" and "the old serpent" in the Book of Revelation 12:9, 20:2 have also been identified with Satan, as has "the prince of this world" in the Gospel of John 12:31, 14:30; and "the spirit that now worketh in the children of disobedience" in the Epistle to the Ephesians 2:2; and "the god of this world" in 2 Corinthians 4:4. He is also identified as the dragon in the Book of Revelation (e.g. ), and the tempter of the Gospels (e.g. Matthew 4:1). The devil is sometimes called Lucifer, particularly when describing him as an angel before his fall, although the reference in Isaiah 14:12 to Lucifer, or the Son of the Morning, is a reference to a Babylonian king. Beelzebub is originally the name of a Philistine god (more specifically a certain type of Baal, from Ba‘al Zebûb, lit. "Lord of Flies") but is also used in the New Testament as a synonym for Satan. A corrupted version, "Belzeboub", appears in The Divine Comedy (Inferno XXXIV). In other, non-mainstream, Christian beliefs (e.g. the beliefs of the Christadelphians) the word "satan" in the Bible is not regarded as referring to a supernatural, personal being but to any 'adversary' and figuratively refers to human sin and temptation. In the Book of Wisdom, the devil is represented as the one who brought death into the world. The Second Book of Enoch contains references to a Watcher called Satanael, describing him as the prince of the Grigori who was cast out of heaven and an evil spirit who knew the difference between what was "righteous" and "sinful". In the Book of Jubilees, Satan rules over a host of angels. Mastema, who induced God to test Abraham through the sacrifice of Isaac, is identical with Satan in both name and nature. The Book of Enoch contains references to Sathariel, thought also[by whom?] to be Sataniel and Satan'el. The similar spellings mirror that of his angelic brethren Michael, Raphael, Uriel and Gabriel, previous to his expulsion from Heaven. [held that] the Old Testament was a scandal to the faithful … and … accounted for it by postulating [that Jehovah was] a secondary deity, a demiurgus, who was god, in a sense, but not the supreme God; he was just, rigidly just, he had his good qualities, but he was not the good god, who was Father of Our Lord Jesus Christ. John Arendzen (1909) in the Catholic Encyclopedia (1913) mentions that Eusebius accused Apelles, the 2nd-century AD Gnostic, of considering the Inspirer of Old Testament prophecies to be not a god, but an evil angel. These writings commonly refer to the Creator of the material world as "a demiurgus". to distinguish him from the One true God. Some texts, such as the Apocryphon of John and On the Origin of the World not only demonized the Creator God but also called him by the name of the devil in some Jewish writings, Samael. According to Mandaean mythology, Ruha Qadishta fell apart from the "world of light" and gave birth to the "Lord of Darkness" (malka dhshuka) named Ur. According to one tradition, Ur is an androgyne lion-headed dragon with the wings of an eagle. Together they create several evil demons, liliths and vampires. Ruha Qadishta is described as a liar and sorcerer. Several Abrahamitic prophets are regarded as servants of these devils or their subordinates such as Adonai, including Moses. Jesus appears as another son of Ruha Qadishta and Ur, who distorted the Baptism-ritual thought by John the Baptist. Eventually Ruha will be rehabilitated and return to the world of light. 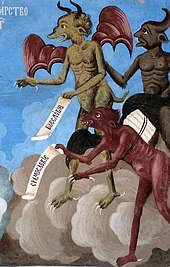 In the 12th century in Europe the Cathars, who were rooted in Gnosticism, dealt with the problem of evil, and developed ideas of dualism and demonology. The Cathars were seen as a serious potential challenge to the Catholic church of the time. The Cathars split into two camps. The first is absolute dualism, which held that evil was completely separate from the good God, and that God and the devil each had power. The second camp is mitigated dualism, which considers Lucifer to be a son of God, and a brother to Christ. To explain this they used the parable of the prodigal son, with Christ as the good soon, and Lucifer as the son that strayed into evilness. The Catholic Church responded to dualism in AD 1215 in the Fourth Lateran Council, saying that God created everything from nothing, and the devil was good when he was created, but he made himself bad by his own free will. In the Gospel of the Secret Supper, Lucifer, just as in prior Gnostic systems, appears as a demiurge, who created the material world. In Manichaeism, God and the devil are two unrelated principles. God created good and inhabits the realm of light, while the devil (also called the prince of darkness) created evil and inhabits the kingdom of darkness. The existing came into existence, when the kingdom of darkness assaulted the kingdom of light and mingled with the spiritual world. At the end, the devil and his followers will be sealed forever and the kingdom of light and the kingdom of darkness will continue to co-exist eternally, never to commingle again. Hegemonius (4th century AD) accuses that the Persian prophet Mani, founder of the Manichaean sect in the 3rd century AD, identified Jehovah as "the devil god which created the world" and said that "he who spoke with Moses, the Jews, and the priests … is the [Prince] of Darkness, … not the god of truth." In Islam, the principle of evil is expressed by two terms referring to the same entity: Shaitan (meaning astray, distant or devil) and Iblis. Iblis is the proper name of the devil representing the characteristics of evil. Iblis is mentioned in the Quranic narrative about the creation of humanity. When God created Adam, he ordered the angels to prostrate themselves before him. All did, but Iblis refused and claimed to be superior to Adam out of pride. [Quran 7:12] Therefore, pride but also envy became a sign of "unbelief" in Islam. Thereafter Iblis was condemned to Hell, but God granted him a request to lead humanity astray, knowing the righteous will resist Iblis' attempts to misguide them. In Islam, both good and evil are ultimately created by God. But since God's will is good, the evil in the world must be part of God's plan. Actually, God allowed the devil to seduce humanity. Evil and suffering are regarded as a test or a chance to proof confidence in God. 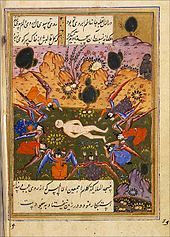 Some philosophers and mystics emphasized Iblis himself as a role model of confidence in God, because God ordered the angels to prostrate themselves, Iblis was forced to choose between God's command and God's will (not to praise someone else than God). He successfully passed the test, yet his disobedience caused his punishment and therefore suffering. However, he stays patient and is rewarded in the end. Muslims held that the pre-Islamic jinn, tutelary deities, became subject under Islam to the judgment of God, and that those who did not submit to the law of God are demons. Like in Christianity, Iblis was once a pious creature of God, but later cast out of Heaven, due to his pride. However, to maintain God's absolute sovereignty, Islam adopts the line taken by Irenaeus, instead of the later Christian consensus, that the devil did not rebel against God, but against humanity. Further, although Iblis is generally regarded as a real bodily entity, he plays a less significant role as the personification of evil than in Christianity. Iblis is merely a tempter, notable for inciting humans into sin by whispering into humans minds (waswās), akin to the Jewish idea of the devil as yetzer hara. On the other hand, Shaitan refers unilaterally to forces of evil, including the devil Iblis, then he causes mischief. Shaitan is also linked to humans psychological nature, appearing in dreams, causing anger or interrupting the mental preparation for prayer. Furthermore, the term Shaitan also refers to beings, who follow the evil suggestions of Iblis. Furthermore, the principle of Shaitan is in many ways a symbol of spiritual impurity, representing humans' own deficits, in contrast to a "true Muslim", who is free from anger, lust and other devilish desires. In contrast to Occidental philosophy, the Sufi idea of seeing "Many as One" and considering the creation in their essence as the Absolute, leads to the idea of the dissolution of any dualism between the ego substance and the "external" substinantial objects. The rebellion against God, mentioned in the Quran, takes place on the level of the psyche, that must be trained and disciplined for its union with the spirit that is pure. Since psyche drives the body, flesh is not the obstacle to human, but an unawarness that allowed the impulsive forces to cause rebellion against God on the level of the psyche. Yet, it is not a dualism between body, psyche and spirit, since the spirit embraces both psyche and corperal aspects of human. Since the world is hold as the mirror in which God's attributes are reflected, participation in worldly affairs is not necessarily seen as opposed to God. The devil activates the selfish desires of the psyche, leading him astray from the Divine. 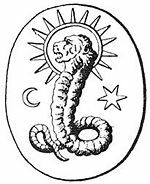 Thus it is the I that is regarded as evil, and both Iblis as well as Pharao are present as symbols for uttering "I" in ones own behavior. Therefore it is recommanded, to use the term I as rare as possible. It is only God who has the right to say "I", since it is only God who is self-subsistent. Uttering "I" is therefore a way to compare oneselves to God, regarded as shirk. Salafi strands of Islam commonly emphasize a dualistic worldview between the believers and the unbelievers, with the devil as the enemy of God's path. Even though the devil will be finally defeated by God, he is a serious and dangerous opponent of humans. While in classical hadiths, the demons (Shayateen) and the jinn are responsible for impurity and possibly endanger people, in Salafi thought, it is the devil himself, who lurks on the believers, always striving to lead them astray from God. The devil is regarded as an omnipresent entity, permanently inciting humans into sin, but can be pushed away by remembering the name God. The devil is regarded as an external entity, threatening the everyday life of the believer, even in social aspects of life. Thus for example, it is the devil who is responsible for Western emancipation. In the Bahá'í Faith, a malevolent, superhuman entity such as a devil or satan is not believed to exist. These terms do, however, appear in the Bahá'í writings, where they are used as metaphors for the lower nature of man. Human beings are seen to have free will, and are thus able to turn towards God and develop spiritual qualities or turn away from God and become immersed in their self-centered desires. Individuals who follow the temptations of the self and do not develop spiritual virtues are often described in the Bahá'í writings with the word satanic. The Bahá'í writings also state that the devil is a metaphor for the "insistent self" or "lower self" which is a self-serving inclination within each individual. Those who follow their lower nature are also described as followers of "the Evil One". In some traditions, divinities can become demons. The Teutonic gods demonized the Giants. 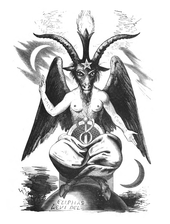 The Baphomet, adopted symbol of some Left-Hand Path systems, including Theistic Satanism. In some religions and traditions, these titles are separate demons; others identify these names as guises of the devil. Even when thought of as individual demons, some are often thought of being under the devil's direct control. This identifies only those thought of as the devil; List of demons has a more general listing. These are titles that almost always refer to devil-figures. Angra Mainyu, Ahriman: "malign spirit", "unholy spirit"
Der Leibhaftige [Teufel] (German): "[the devil] in the flesh, corporeal"
The Father of Lies (John 8:44), in contrast to Jesus ("I am the truth"). Old Scratch, the Stranger, Old Nick: a colloquialism for the devil, as indicated by the name of the character in the short story "The Devil and Tom Walker"
Krampus, in the Tyrolean area also Tuifl. ^ "Definition of DEVIL". www.merriam-webster.com. Retrieved 2016-04-23. ^ Kelly, Henry Ansgar (2006). Satan: A Biography. Cambridge, England: Cambridge University Press. pp. 3–4. ISBN 978-0521604024. ^ a b c Leeming, David (2005-11-17). The Oxford Companion to World Mythology. Oxford University Press, USA. ISBN 9780195156690. ^ "Definition of DEVIL". www.merriam-webster.com. Retrieved 2016-06-12. ^ Fritscher, Jack (2004). Popular Witchcraft: Straight from the Witch's Mouth. Popular Press. p. 23. ISBN 0-299-20304-2. The pig, goat, ram — all of these creatures are consistently associated with the Devil. ^ See, for example, the entries in Nave's Topical Bible, the Holman Bible Dictionary and the Adam Clarke Commentary. ^ "Do you Believe in a Devil? Bible Teaching on Temptation". Retrieved 2007-05-29. Herbermann, Charles, ed. (1913). "Marcionites" . Catholic Encyclopedia. New York: Robert Appleton Company. Herbermann, Charles, ed. (1913). "Gnosticism" . Catholic Encyclopedia. New York: Robert Appleton Company. ^ Rouner, Leroy (1983). The Westminster Dictionary of Christian Theology. Westminster John Knox Press. p. 166. ISBN 978-0-664-22748-7. ^ a b Acta Archelai of Hegemonius, Chapter XII, c. AD 350, quoted in Translated Texts of Manicheism, compiled by Prods Oktor Skjærvø, page 68. ^ a b Smith, Peter (2000). "satan". A concise encyclopedia of the Bahá'í Faith. Oxford: Oneworld Publications. p. 304. ISBN 1-85168-184-1. ^ Bahá'u'lláh; Baháʼuʼlláh (1994) [1873–92]. "Tablet of the World". Tablets of Bahá'u'lláh Revealed After the Kitáb-i-Aqdas. Wilmette, Illinois, USA: Bahá'í Publishing Trust. p. 87. ISBN 0-87743-174-4. ^ "Vísindavefurinn: How many words are there in Icelandic for the devil?". Visindavefur.hi.is. Retrieved 2012-04-05.